Posted by Eric Miller on Monday, February 15th, 2010 at 7:45am. Just prior to the end of the year a 2 Bedroom condo sold in the Illini Tower for $395,000. These units are approximately 1600 square feet, and this relates to a sales price of about $246 per square foot. In April of 2007 a unit sold for $795,000. On the surface it looks like prices have dropped almost 50%. This is not true. The unit that sold for $795,000 had received a total, spectacular renovation that I would estimate today would cost today over $150,000. This would place the price decrease from 2007 to 2010 at approximately 30%. This is a much more realistic number for this superior location. The Illini is all about location, and it is not for everyone. It is located on a triangular piece of property where A1A's North and South bound lanes separate. 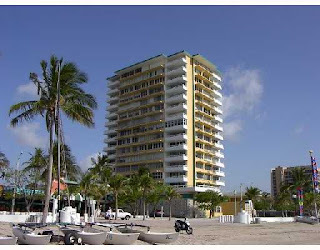 It is in the middle of Fort Lauderdale's busiest beach area, and simply its a location that people who live there love, and find irreplaceable. Remember those rules of real estate location, location, location, they certainly apply to the Illini what you are buying at the Illini is location. The building was built in 1964, it is 17 stories tall, and has only 52 units. The building was built without central airconditioning ( common for its age ) so each condominium has individual units through the wall. The builidng does sit feet from the beach and the swimming hall of fame. When buying in the Fort Lauderdale area, Eric Miller and Associates can help you comparison shop with an expert on your side, we are always here to help.